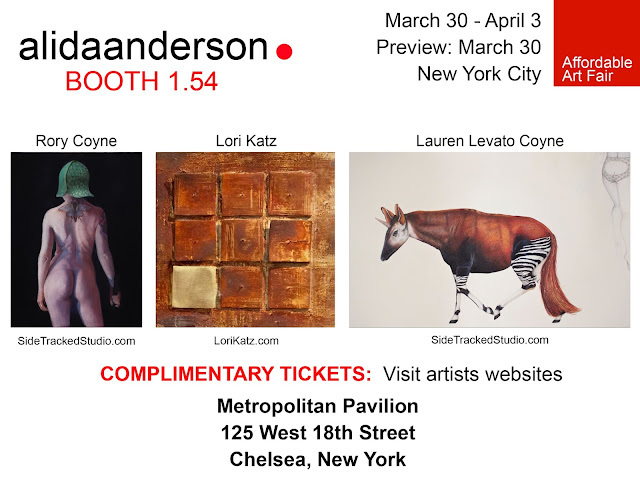 Alida Anderson Art Projects is pleased to present the work of three outstanding artists during the Spring 2016 Affordable Art Fair NYC. In light of Women’s History Month we would like to highlight the two women in our booth, Lauren Levato Coyne and Lori Katz. The artists both employ a graphic use of space and bold color but execute their final works with very different styles and media. Levato Coyne’s drawings feature animal and human forms in various levels of realism and Katz works in ceramic to create graphically inspired 3D wall pieces. Lauren Levato Coyne (Chicago, IL) works almost exclusively in colored pencil using themes of poison, violence, and addiction. “My drawings are paralinguistic symbolist portraits and still lives where meaning is indicated but encrypted,” said Levato Coyne. By combining lush realism with an economy of line and negative space Levato Coyne creates a schema that differentiates the human from the flora and fauna that populate the work. This schema differentiates the division between interior and exterior, reality and non-reality. Her drawings and paintings are shown in New York, Denver, and Los Angeles among other cities and can be found in private collections from NYC to Chicago, Germany to Italy. Katz's work has been selected for juried and invitational exhibitions in the US, Europe and Asia, and is included in public and private collections throughout the world. "You might find them disturbing, but you also might be unable to turn your eyes away from Houston artist Phillip Kremer's grotesque, distorted portraits of politicians like Donald J. Trump, Ben Carson, and Bernie Sanders."